Well, in a word, spectacularly. There are many pitfalls to owning and operating a business, and one of those I see most often is the difficulty to maintain outdoor lighting. Most businesses can internally change an incandescent or fluorescent lamp, but maintaining outdoor lighting is more complicated. Traditional outdoor lighting consists of a high intensity discharge bulb and ballasts. Often requiring a lift or extension ladder to reach, these lights use a ton of electricity and can last 5,000 to 20,000 hours. However, as the ballast is worn, that life span can decrease significantly. 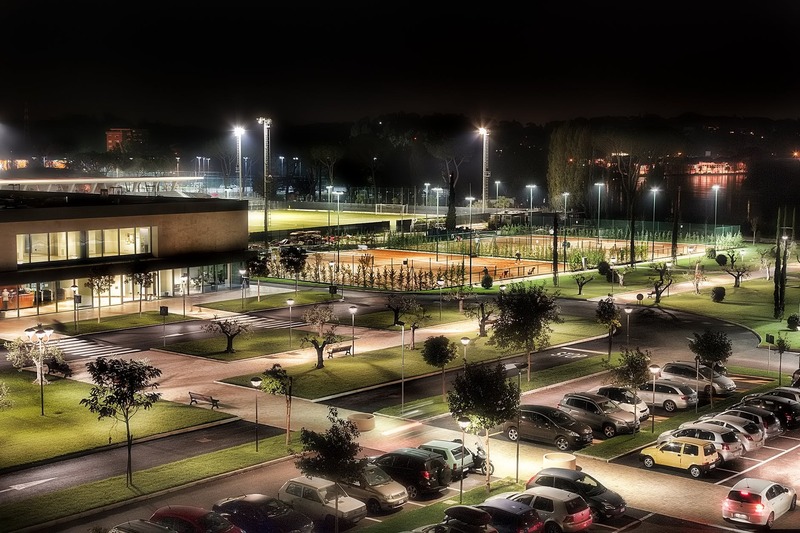 LED lighting replacements for metal halide exteriors have incredible benefits, some of which are more obvious than others. The main benefit that a business will enjoy is the longer lift of LED fixtures and replacements. New fixtures can last from 50,000 hours up to 100,000 hours, and really that longevity is only limited based on the quality of the driver. This is so key when businesses can spend hundreds of dollars for service companies to come and change a HID or ballast frequently, as sacrificing safety or visibility for a business is not often an option. Energy savings is also a key component of LED lighting performance. Typical exterior LED lights use 20-30% of the wattage of comparable traditional fixtures. This can lead to incredible Returns on Investments (ROI), even without incentives from utilities. As an incredible bonus, the lumens per watt of these outdoor fixtures continues to increase, and in 2017 we seem to be on the precipice of 200 lumens per watt. Since exterior lights are often left on for longer hours, especially in our cold and dark winter nights in Chicagoland, the energy savings is even more important. Exterior LED lighting is also available in a higher kelvin color temperature, creating a brighter and crisper light. This is obvious to the eye, if you’ve seen a store with new LED lights next to a store with older lighting. People also describe this is daylight, but we feel that the ideal color temperature in Chicagoland for exterior lighting is 5000k. It literally can make a business feel more inviting and approachable, and is noticeable as you drive down a street in your town. In fact, I remember years ago as gas stations in our area were converting to LED and you could notice the difference that LED had on the approachability of certain gas stations. It felts safer, more inviting, and likely had increased sales definitively from this investment. Finally, exterior lighting with LEDs pair great with advanced controls. Photocells and occupancy sensors are better partners with LED, as the drivers are more responsive and the lights turn on instantly and can dim. Often, we see businesses add occupancy sensors to exterior lighting to add a layer of safety or additional ways to check footage of security cameras. One final note -- older lighting ballasts are incredibly difficult to maintain. Often, you will hear a loud audible buzzing sound near older exterior lighting. What better way to discourage customers to your business than a loud and irritating sound as they walk in from the parking lot? Replacing the lamp will not fix this, but a new LED fixture or solid retrofit solution will. Converting to LED will not only solve all of the above issues and enjoy a lot of the benefits, but it will also pay for itself in energy and maintenance savings. Where else can you spend money on your business, improve customer experience, save operating costs, and decrease maintenance costs? Not sure where to start? Verde is here to help. Next What Is an ECM Type Motor?